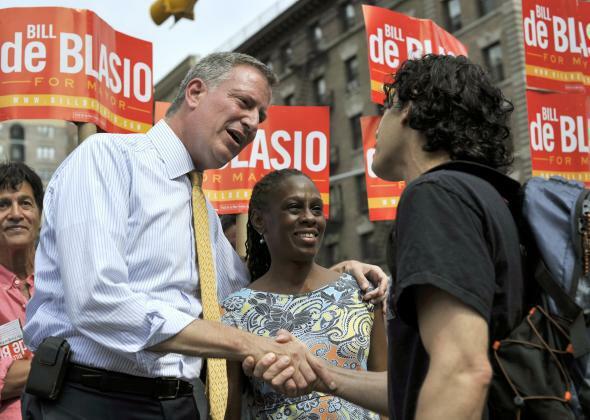 Bill De Blasio and Chirlane McCray: The story of how they met. New York City mayoral candidate Bill de Blasio with his wife, Chirlane McCray. A week or two later, McCray was puzzled to pick up the phone and hear de Blasio’s voice on the line. After listening to him ramble for a few minutes, she finally blurted out, “What do you want?” After a tangible silence on the other end of the line, he slowly said, “I simply thought that we might have lunch one day.” Embarrassed, she took him up on his offer, and they went to lunch a few days later on an unseasonably cold September day. They started dating, but McCray was still hesitant to get serious, had a lot of things to work through in her head. She told him they needed to slow down. They did—for 22 years. So there you have it: not as scandalous as the original article might have you believe. It’s the media’s job, after all, to pan muddy river beds for glinting nuggets of scandal. But the murk is usually much more interesting.